I have a hard time forgiving myself for things that I've done in the past. I look back on my life and I question men that I've been involved with, people I've allowed in and out of my life, the things I've allowed people to do to me, the battles that I've chosen to fight or not fight, and the reasoning behind those decisions. Admittedly, I have made many poor choices in life. Some of the worst decisions I've made have been a result of me not listening to the advice of my mother and father and grandmother. Most importantly, these decisions were a result of not listening to GOD. But how does the saying go, you can't cry over spilled milk. Right? So, there's no need for me to keep beating myself for decisions that I made. I can't change the past. Last time I checked, no one can change the past and, if you can, please contact me ASAP! OK, seriously though, no matter what decisions we've made in the past, no matter how bad things were or even are today, we can not change them. No one person is perfect, and we all make mistakes. In hindsight, we may regret some choices we've made or wish that there were do overs in life, but there aren't. There's no need to keep harping on things that we have no control over. The only thing we can change the outcome of is tomorrow. 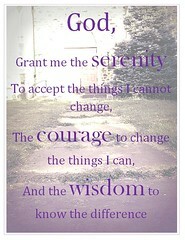 I know I mentioned my use of the Serenity Prayer on Day Six, but I'm just going to reintroduce it today. When things in my life become overwhelming, I say to remind me of just this. Since there is nothing we can do about yesterday, keep moving forward and working to change your tomorrow. Put in some more "KNEE TIME" and ask GOD to guide your steps and choices you make, so you can move in the direction that you want to move in. You will make a mistake again, and it's not the end of the world. But don't let me or anyone or anything rob you of your joy and happiness. Start being happy for today. Don't worry about what happened in the past anymore. Start thinking about what you want to do with your tomorrow. Remember, DIVAS keep it pushing! left in the hands of God and Jesus. 2012 Great Release Challenge - Day Fourteen - Friday!